Be Inspired. Be Beautiful. Be Wed. Ask about our Boutique Hotel, now open! You found the right guy, and discovered the perfect dress... your Wedding Day shouldn’t be anything less than amazing! ALL YOU NEED IS LOVE Prim Paper Co.
FREE TOOLS, RESOURCES, GUIDES AND MORE TO HELP YOU PLAN YOUR BIG DAY ON WWW.WEDDINGIDEASOK.COM! 1. TOP 25 WAYS TO STRETCH YOUR WEDDING BUDGET — Never worry about your wedding budget! You can learn how to stretch your budget using this helpful e-book. 2. ALLSEATED.COM — The seating chart tool to make all of your seating dreams come true. 3. ZOLA.COM — This handy online wedding registry will ensure all of your guests purchase the gifts of your dreams for you! Zola even keeps track of who bought which gift for you, so sending out your thank-you cards will be a breeze. 4. APPY COUPLE — An affordable wedding website that features online RSVPs for guests, registry integration, and offers you a space for introductions of your wedding party. 5. HONEYFUND — Honeyfund is a unique online wedding registry that allows your wedding guests to help fund your honeymoon! A lot of couples live together before getting married, and no longer have a need for a new vacuum cleaner or a fancy gravy boat. Honeyfund lets you share your destination and plans with your guests and makes the whole process fun and personalized! 6. 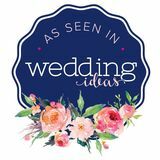 PINTEREST — A wonderful place that allows you to group all of your wedding ideas together. Your bridesmaids can even collaborate with you on hair, décor and photography ideas. Pinning each idea on the board will allow you to watch the wedding magic come alive. 7. WEDDING HAPPY IOS APP — This app works wonders with your budget by keeping track of dates and payment. It will even track the tasks on your to-do list, too! Opportunity to get to know the photographer before the wedding day. Be prepared for wedding day pictures after â&#x20AC;&#x2DC;posingâ&#x20AC;&#x2122; during a bridal session. Get comfortable wearing and moving around in wedding day attire. Have a hair and makeup trial run. 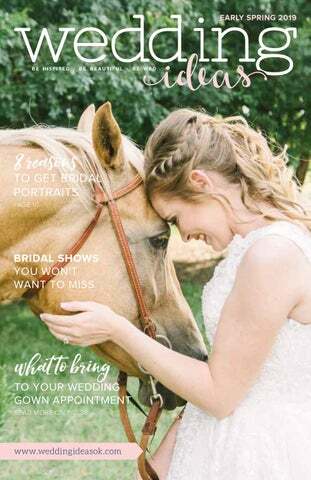 Capture beautiful pictures of YOU (and a loved horse) in your wedding dress! Have a slower pace versus the wedding day schedule. Ability to take pictures at more locations. Have a great focal point for a wedding day display at the reception and home. Beautiful blooms for your big day. Call Coleman’s for your wedding floral! Décor Rentals & Design Studio The best kept secret in Oklahoma is out! Belflower Chapel, originally a historic Catholic church, has been beautifully renovated while maintaining it’s old world charm. Beginning at $3950, our wedding packages include: • wedding planning services • tables, chairs and linens • set up and clean up • food and beverages • an in-house DJ • a 3-tier wedding cake • AND MORE Call today to schedule your personal consultation and tour! The Hall at the Railhouse is a beautiful wedding venue housed in a century-old warehouse in downtown Norman. Originally opened in the 1930â&#x20AC;&#x2122;s, The Hall offers guests a historic atmosphere with rustic charm. The facility has a bridal room and ample parking to make your day absolutely perfect and worry-free. The professional staff is able to coordinate each event down to the last detail. The delicious array of food and beverages are provided by the top catering company in the region, Abbey Road Catering.With wood-barrel ceilings, original oak flooring, chiavari chairs, and farmhouse tables, The Hall at the Railhouse is the perfect setting for your wedding, reception or event all year long. Panchoâ&#x20AC;&#x2122;s Liquortown Your wedding beverage specialist. Weâ&#x20AC;&#x2122;ve been helping brides celebrate their big day for over 60 years! In house consultation for wine, beer & spirit food pairings. WEDDING at a GLANCE "I always knew Ben was the one for me and I remember looking into his eyes and knowing I’m marrying my best friend. The man I’ve been in love with for so long and knowing I was right where I should be. Looking over the ocean and marrying your best friend." WHAT WE'RE ALL ABOUT The Bridal Boutique is focused on customer service and making shopping for your wedding gown easy, fun, and memorable! We strive to treat every bride and her family like our own friends and family the moment they step into the boutique. Our large selection of hand-picked gowns and our friendly and knowledgeable consultants will help find a gown you love! DO I NEED TO MAKE AN APPOINTMENT? We want to give brides and bridesmaids our full attention when trying on gowns. To assist in any way we can on Saturdays we do require an appointment, but on weekdays please call ahead to let us know you will be coming. WHAT SHOULD I EXPECT DURING MY APPOINTMENT? To be greeted by your consultant at arrival. Then asked about styles you love or if you have pictures of things you like online and your budget. During your 60-90 minute appointment we help pull about 8-10 dresses for you to start trying on. Once you narrow down to 2-3 favorites we help you visualize the whole look by adding veils, belts, or headpieces. WHO AND WHAT SHOULD I BRING? We highly encourage brides to bring 2-3 people, who truly know what the bride envisions her gown to look like, to her appointment. Please let us know ahead of time if more than 4-5 people are coming for us to prepare seating. Bring pictures of dresses that you like. Bring the shoes (or similar shoes) you plan to wear on your wedding day or at least have an idea of the height you would feel comfortable in, as many gowns we order need a custom length. And do not forget your camera because, unlike other shops, we allow pictures to be taken so you can remember the details of the day! The Oklahoma Bridal Show okBride has been in business since 2002 and has produced 60+ premiere bridal shows. Our approach is simple: connect the beautiful bride with the right wedding professionals. "We've had the privilege of working on some incredible ceremonies this year. One of my all-time favorite weddings of 2018 belonged to Lindsay and Elliott. It was so unique and unlike any other weddings I've seen this year. They're huge fans of the Beatles, so instead of numbers each table was marked by a different song title. I thought that was so cool!" - Laura, Calligrapher from Prim Paper Co.
" G E T F E AT U R E D " WINNER Lindsay and Elliott This featured wedding was entered into our "Get Featured" contest and won. Keep an eye out for another chance to win. Use one of our photographers and increase your chance to be featured! Best Wishes Lindsay and Elliott! Get in the best shape of your life for the best day of your life! OPEN 24 HOURS EVERY DAY! Wedding at a Glance "We had a civil ceremony with only family and close friends seated in chairs for a more intimate feeling. The rest of the guests were seated at their tables for both the ceremony and the reception. The reception was laidback and fun! Everyone who knows me and Blake knows we LOVE animals, but especially dogs. We incorporated that love by having dog toys as one of our wedding favors-it was a huge hit! We also included different pictures from our 6 years together as parts of our centerpieces. We were high school sweethearts, so there were some priceless throwbacks in the mix!" WHBWIBRIDE22 10% off first purchase, void after 2-22-19, may not be combined with other discounts. FEATURING EUROPEAN STYLE WITH RARE ARCHITECTURAL ANTIQUES PROVIDING A COMPLETELY UNIQUE WEDDING EXPERIENCE. "Each detail of Justin & Morgan's wedding was perfectly planned! Morgan's three daughters were doted upon as much as she was. They started the day at Dodd Salon drinking sparkling cider and getting their hair done. Then, over to the Old Trinity of Paseo where Morgan gave each a special ring with their birthstone whileJustin got ready at the Skirvin Hotel. All could see how Justin adored his bride. The ceremony was beautiful and a highlight for all of the guests was watching Morgan's daughters look at her with so much love and happiness. The reception was at Castle Falls, and Aunt Pitty Pats catered the event. The celebration ended with rose petals in the air and a very happy bride and groom exiting towards their awaiting limo. The perfect ending to their special day." RESOURCE GUIDE 2019 Please call 405-216-0747 hello@weddingideasok.com www.weddingideasok.com ©WEDDINGIDEAS™ 2019 This Directory, in part or whole, is not to be reproduced or copied without written permission. Wedding Ideas is a trademark of Hidden Values, Inc. 214-559-7283 Wedding Ideas of Oklahoma City cannot be held responsible for advertising services. At Ned's Catering, we remain committed to creating a memorable wedding reception with delicious foods and exceptional service. Our passion for creating memorable weddings shine through each and every bite.